There are several variations of bowel resection, which in the elective setting is most commonly done for cancer treatment. The above procedures all begin with a laparotomy or laparoscopy, which will also include an assessment of each organ in turn, including inspecting the entire length of the bowel, palpating the liver and spleen, inspecting the gallbladder, and (in the female) assessing the uterus and ovaries. 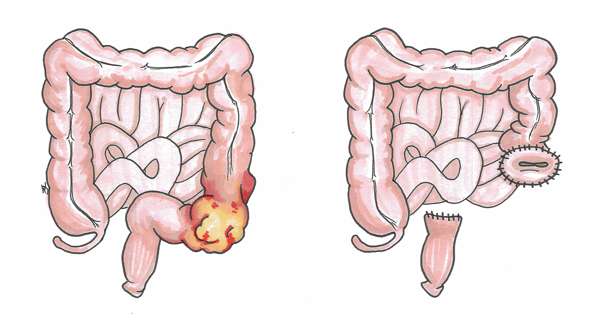 The appropriate segment of bowel is then resected by dividing and securing the blood supply, then transection of the bowel followed by reanastomosis or stoma formation. This can be done by hand or using a stapler device. Haemorrhage Damage to any of the surrounding structures, particularly veins in the pelvis, can cause significant haemorrhage. Injury to spleen and ureter The spleen can be damaged during mobilisation of the splenic flexure (particularly if it is located high up) and could necessitate splenectomy. The ureter is also at risk, particularly in left-sided resections. Resection of another organ If the cancer is advanced, it may be necessary to remove parts of other organs (e.g. spleen, bladder, uterus). Stoma Formation A stoma or colostomy may be required in cases where a primary anastomosis is unlikely to heal, such as due to contamination or in a malnourished patient. Optimise your patient pre-operatively and avoid peritoneal contamination (these are often unmodifiable by the time of consent). Pain The patient will most likely have an epidural or patient controlled analgesia to minimise this. Seroma A swelling of lymphatic fluid may occur in the abdomen due to disruption of the lymph nodes and channels. Anastomotic leak (5-10%) The anastomotic site or stoma may have insufficient blood supply due to ligation of the corresponding arteries. These may break down requiring further surgery. Reintervention There is always a potential for further surgery due to anastomotic leaks, reversal of stoma’s, further washout etc depending on the underlying pathology. Note: This article is for educational purposes only. It should not be used as a template for consenting patients. The person obtaining consent should have clear knowledge of the procedure and the potential risks and complications. Always refer to your local or national guidelines.